Few things scream "football food" like Rotel Dip. It has been staple at our house during football season for as long as I can remember. I absolutely love the warm spicy cheesy goodness! Be warned, this queso is highly addictive. I can make a meal out of it on a Saturday. You can jazz the queso up with some hamburger or sausage, but it is hard to beat the original with just Velveeta & Rotel. Rotel has been kind enough to offer my readers a HUGE Prize Package. Queso for 100, Goodies from FansEdge AND a $50 grocery card! 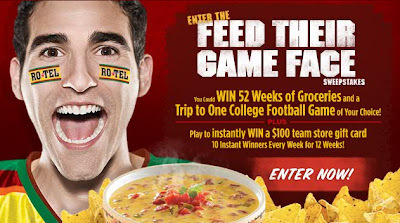 Go to the Rotel site (here) and enter the Feed Their Game Face Sweepstakes. The grand prize is a a years worth of groceries and a trip to any college game in 2011 (tickets, flight and lodging). Come back to this post and leave a comment that you entered. It's that simple! 1. Become a follower of my blog (over on the right hand side) and leave a comment that you are following me. If you are already a follower - leave a comment that you are already following. 2. Tweet about the giveaway! Come back and tell me you tweeted and leave your twitter id. 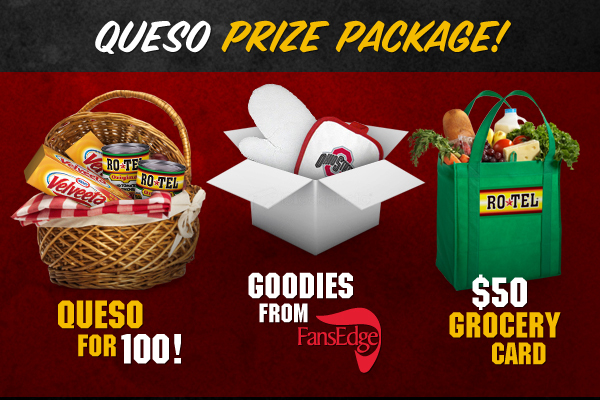 That gives you up to 3 chances to win the prize pack of Queso for 100, Goodies from FansEdge AND a $50 grocery card. You have until Thursday, October 28, 2010 at 5:00pm CDT to enter. The winner will be chosen using www.random.org. I will announce the lucky person on Friday, October 29th. Mix a 10oz. can of Rotel with a 16oz. package of Velveeta Pasteurized Prepared Cheese Product cut into ½” cubes. Heat Microwave on HIGH for 5 minutes. Stir after 3 minutes. Stir and serve with tortilla chips or assorted cut-up vegetables. I'm have been following your blog for a couple of weeks. I love your recipes! I also just entered the Feed Their Game Face Sweepstakes on teh Rotel site! Fun! I entered the Rotel sweepstakes. I just started following your blog a week or so ago and I love it! I entered the contest! I entered the contest! What a GREAT giveaway! I love me some Rotel. I entered! Entered! I hope I win! I'm entered...I would love to win this! I have been following your blog for several months and have made several of your delicious recipes. War Eagle! I did the deed and registered at Rotel and I'm officially a follower! I entered the Ro*Tel sweepstakes. Love that stuff. I entered the Rotel sweepstakes! I also am now following your blog! I entered the contest too! i love your blog! the kitties are the cutest. i entered the sweepstakes and am following your blog! WDE! I love rotel, just used it in a chicken recipe. I came across your blog a few weeks ago.....love the name! I entered, and I follow your blog! I completely understand how this could be very addictive! I entered the Rotel Giveaway! I entered for the Rotel Giveaway! I am now following you!! Oh yeah - I follow your blog through my Google reader. one of my favorite versions of this recipe is from The Pioneer Woman. I just entered the contest. I love your blog this time of year because your tailgating recipes are perfect and easy when I have to take food to work. I just entered the sweepstakes...thanks for the heads up....I Love Cheese & Football! Also....I have been reading your blog on Google Reader....but now I am a follower! Check out my blog...I have been slacking lately, but there are lots of good eats! Very cool giveaway! Both of them. I've never had rotel and velveeta. I usually add chili but will try it with the rotel. I've been a follower from waay back! :) Thanks for the chance to win here and telling us about the other giveaway! I've been entering EVERY day! Hi! I have been subscribed to your blog via Google Reader for a while, but am just now *officially* following! I love Rotel dip too!! Now I want some... thanks for bringing on that craving!! Hey Steph! We obviously follow you blog and have been forever! We are making your penne tonight. We entered the Rotel Challenge also. I already follow you! I love this recipe. We do add the hamburger. Great for football season! I entered the sweepstakes and started following you for all of your great tailgating recipes. I entered and my chip almost fell in the dip! And I'm now a follower via RSS!!! I've been reading you in my rss feed for a long time, but I'm now officially a follower! I am also a follower!!! Just officially followed your blog-- though its been in my reader for months! I am a follower! Actually I love your blog! It is my go to blog of the day! I just found you through KevinandAmanda. Fun blog. Enter Me! I just became a follower too! I found you through Kevin and Amanda too! and now follow your blog! and I entered the Rotel contest! I entered the sweepstake - found you through Kevin & Amanda! I'm following your blog! Your recipes look so yummy! Just entered the contest. Thanks! Following the blog now. Thanks for the extra entry. I entered the Rotel Sweepstakes on their site AND I played their little game. I LOVE LOVE LOVE LOVE Rotel....this would be the greatest thing ever to win! I signed up to receive your feed! I'm a follower! lol! I just signed up to follow your blog, I found you through Amanda's blog - I can't wait to try your recipes as I'm always looking or new ones! I enter the contest. I need to make this dip. It looks yummy. I just entered the sweepstakes! I am following :) Love your blog! oh, and WAR EAGLE!!!!!! I just submitted my entry on the ro-tel site! I've been a subcriber to your blog for about a month. Love your site! This is my first but not my last visit to your blog. Your recipes look wonderful. I just entered on the Ro-Tel site. Saw your blog on Kevin and Amanda and just added you to my Google Reader. Wonderful blog - I cannot wait to make the Nutella Gooey Butter Cake! I entered the contest! Good luck to all! I just became a follower. Found you from a link on another blog. Great stuff on your blog! I have been following your blog since July and I love it. Not only do I get to see the great recipes on here, I'm also a taste tester friend/coworker! I love it. I am now following your blog!! I follow your blog...L O V E your recipes!! !